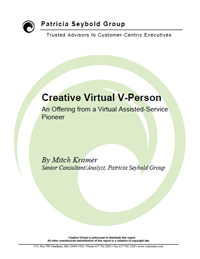 Creative Virtual, a leader in self-service customer experience management solutions for global enterprises, announced recently that its V-Person and V-Portal products were positively reviewed by the Patricia Seybold Group as go-to solutions for enterprises looking to improve customer satisfaction and secure brand loyalty. Specifically, the report cites Creative Virtual’s recently launched V-Portal knowledge management system as its most significant strength and differentiator in the industry. Summary: 2011 was a big year for NLP - the science of teaching computers to communicate with humans in plain English. First IBM’s Watson beat Jeopardy champions Ken Jennings and Brad Rutter. Then Apple captivated mobile consumers with the iPhone 4S, which included an enhanced version of Siri, the voice-driven assistant born at Menlo Park, CA-based SRI International. Suddenly, the idea that computers might be just as good as humans at carrying out certain types of requests seemed a lot less far-fetched. For companies trying to win corporate and consumer adoption of their own NLP technologies, this is a long-awaited moment. And one of the firms that thinks 2012 could be the year this market really takes off is VirtuOz VirtuOz, Inc., a Paris-born company that moved its headquarters to Emeryville, CA, in 2009. VirtuOz, Inc., the leading provider of intelligent virtual agents (IVAs) for online marketing, sales, and support, today announced the company has been selected as a winner of the Best in Biz Awards, taking gold in the Best New Service of the Year category. Hundreds of entries were received in this year’s awards program from an impressive array of public and private companies across multiple industries, sectors and regions. The winning companies represent the best in American business. BotGenes created the BG200K “Spanish NLP Brain”, capable to handle more than 200.000 Spanish expressions including regionalisms, common typos, orthographical and grammatical mistakes.